Bob Moore of Texas ordered 5g of Viresco™ Aqua on 29th May to treat his small pond He received it by 1st June and he emailed us on 28th June. In his e-mail he said that after about 2½ weeks, the algae turned brown. Then, in a few more days the water cleared. The “Before” and “After” photographs below illustrate the results. "Your products STILL exceed all one's expectations. 100% recommendations from me!" "Your product is frankly magical in its effectiveness and I have just bought another small sachet of the 'Aqua' as backup for later in the year although I doubt I will need it. Your product has literally saved me over a hundred pounds a year and many hours of toil. Thank you again." "Just a note to let you know how delighted I have been with the results of using Viresco Aqua to clear algae bloom from my fish pond. I followed the instructions given in the leaflet and was amazed that after one day the bloom showed signs of clearing. After three days the water was virtually clear." "(Viresco Koi) Well to keep it short – it worked great! …I rode out the rest of the season with no blanketweed appearances at all! Needless to say, I remain a big fan and proponent of Viresco and your wonderful product!" "Love your Viresco Aqua! Struggling for 10 years with our pond here in Pennsylvania. Stumbled on your website and loved what I saw. Ordered your product and pond is now fantastic. Fish are happy, lilies are happy and we are very happy. No more green water!! Thanks so much!" "Last summer I obtained a packet of Viresco Aqua and I have found the product highly effective in clearing my small fishpond of green algae. The water has been beautifully clear ever since application and I have been most satisfied." "I just wished to report that one week ago I treated my small pool approx 275 gallons with one eighth of your 5g pack of Viresco Aqua and the results are absolutely superb! Since the water temperature has only just begun to rise there wasn’t much blanketweed but I am troubled badly by it in the summer. However the water was not a good colour but is now sparkling and the fish are very active. I’m looking forward to a good pool summer. Best remedy I’ve ever tried and very economical and you can quote me." "Just a note to say that the Viresco Aqua worked beautifully last year with only one application, hence the reorder. I had blanket weed growing at about 6”+ per day and it was a nightmare to control. The Viresco Aqua took about 3 weeks to work fully but what a difference it made. The pond was totally clear of the blanket weed and I could at last see the fish properly. I shall be using it again this year but much earlier this time. I am fully convinced that I won’t suffer from the problem at all and I wholeheartedly recommend the product. Thank you." "Re: the Viresco Aqua I sampled. I would just like to say, what a transformation in my pond in just four days. I would recommend to any pond owner." 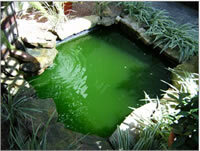 "I have been trying for a couple of years to rid my pond of blanket weed and also green water. I have used all of the products that have been recommended by various aquatic departments in garden centres etc with no success. I then came across an advert for Viresco™ Aqua. I phoned you for advice on the products; you recommended what treatment for the size of pond etc. and all the blanket weed and green water cleared. I would and will recommend your products to anyone and would like to thank your for your advice." "Viresco Aqua has cleared my wildlife pond of blanketweed! I am thrilled and so are my fish! I'm amazed how fast it took effect - your product works - Thank you." "Viresco Aqua has cleared my Wildlife pond of Blanketweed! I am thrilled and so are my fish! I’m amazed how fast it took effect. Your product works. Thank you. " "On Saturday the Koi pond was green and the fish were difficult to see in the deep end. I was having to wash the filters daily due to blanketweed. Added 15g Viresco Koi on Saturday evening. Today is Wednesday and I’ve just cleaned the filters. The production of blanketweed has dropped and the water quality has improved hugely. This really is a phenomenal product. I can’t recommend it highly enough." "I really love your product. I almost gave up on keeping a koi pond because the string algae was such a problem. It was like creepy, long, green hair everywhere! I tried various solutions, but nothing really worked well. I am so glad I decided to try Viresco, because it started to work within days! One or two applications gets my pond through most of the year here in sunny Arizona. I don’t need the rake anymore. Yeah! " "Thanks again for the Viresco Aqua. As you may remember, I was going to fill in my pond, having for many years failed to control an algal problem. 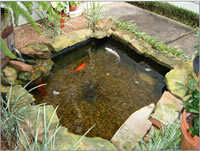 Meeting you at the Koi show has enabled me to have the pond feature I wanted." "I just wanted to thank you for creating Viresco Aqua. My 1400 gallon pond was covered with blanketweed and starting to grow the peasoup kind. Within a couple of days, the pond had no more algae and the water was so clear. My fish are much more active now as well. Bravo for an awesome product!!!" "We received our last order of 5g and cannot believe the difference in our pond. Never has the water been so clear. Our fish have been quite happy and we have literally thousands of eggs attached to the walls of the pond." "I feel I must put pen to paper to let you know how happy I am after purchasing Viresco™ Aqua in May of this year. I decided to give your product a try as I was suffering blanket weed problems and was attracted to the fact that it was not a chemical, and also promoted fish health. From about two weeks after using, my blanket weed had disappeared and my fish although already healthy, were bursting with life and feeding ravenously. Also I have never had so many blooms on my lilies and the leaves stay greener for much longer. I shall be using this product on a regular basis. " "Re Blanket Weed. Much has been written of this curse of the Koi pond. I have a 5,000 gallon pond, and for many years I have been frustrated with this persistent and virulent weed. I have for years tried many of the products including electronic and magnetic. Most of the powder or liquid products work for a short time but need monthly treatments. A year ago I tried VIRESCO™ . Within two weeks the blanket weed started to die off and within a further two weeks it had vanished. Since then I have had no blanket weed problems whatsoever.I was, and still am delighted . The product has worked for me."